For those of you travelling by train from Central. We will be at the entrance of platform 11 @ 10.30 (get your return ticket to Woy Woy first) see you then. Well people, the final official event of the year is upon us. 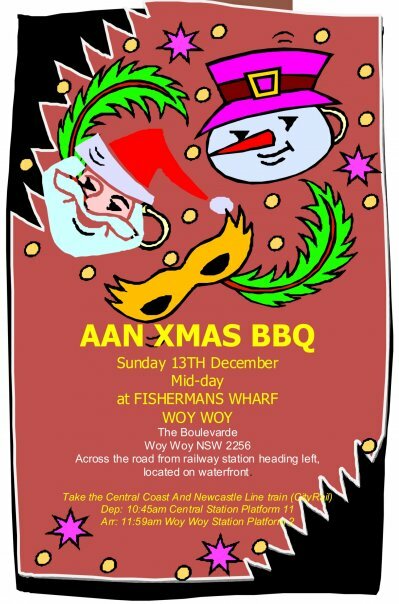 To share the love with the coastal tribe we will be having the BBQ @/near Fishermans Wharf Woy Woy. Hope you can come and show your support. This entry was posted in AAN Events, Australian African Network, General, Uncategorized. Bookmark the permalink. Hi Shelley, we try and post events 2 – 3 months in advance – the 6 month calendar is a great idea but we haven’t managed to di it yet. Our first meeting for the year is in mid-Feb so hopefully we can map out the next few months then. Hope you can make it along to something soon. Hi Jill- i have noted down the date- easy to remeber at least! The other half will be away then- is it ok if i come without him? and is it BYO food and drinks?